It wasn’t so long ago when we were not concerned about what we’re putting on the table. We buy the ingredients from our grocery stores, slice them up, cook them with vegetable oil and voila, we have a dinner for the whole family. But the recent decade has ushered in a global phenomenon of organic farming. Practically everyone now has an idea or knowledge about what organic farming is and how it can help human health and the environment. It is unfair to say that organic farming came out of nowhere or that human actions have always been harmful to the environment which triggered the need for non-conventional farming methods. The truth is, humans were the primary protector of the environment. They were active in making sure that crops grow healthily and that these would not pass on any kinds of diseases to consumers. But alas, commercialism and rapid capitalism have changed the way conventional farmers look at their crops. Now, your ordinary sack of potatoes is worth hundreds of dollars. A truckful of crops? That’s worth thousands of dollars. It led farmers to turn to chemical fertilizers and pesticides that will initiate the rapid growth of the crops, which farmers then sell to grocery stores, markets, big supermarkets, bodegas, etc. For years, we consumed what was equivalent to filtered pesticides and insecticides. You can imagine what kind of diseases these harmful contaminants brought to humans. But more than that, modern organic farming was a response to the environmental harm caused by the use of chemical pesticides and fertilizers in conventional farms. Organic farming also has numerous ecological benefits. 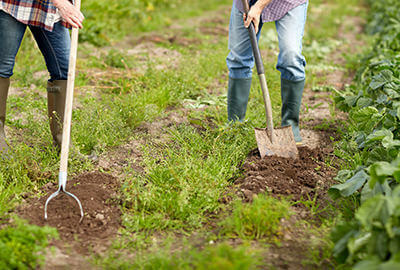 Compared with conventional farming, organic farming uses fewer pesticides (sometimes, no pesticides at all), reduce soil erosion, decrease nitrate leaching into the groundwater, and recycles animal wastes back to the soil. Organic farming, of course, does have its drawbacks in terms of profit generation. Because organic farming is more conservative and does not use synthetic fertilizers that help grow the crops quickly, it has a lower yield and higher food cost for consumers. Studies have found that yields of organic crops are down by 25% compared to conventionally-grown vegetables and fruits. This is especially true during the three-year transition period from a conventional farm to an organic farm. The challenge is to find support from both the community and the government for conventional farms to start turning their lands into organic farms. That way, when the yield is higher, the food produced from these crops will cost less to the consumers than they do now.